Because were someone to ask Louis “so how was it, being poor?” (and someone does) he’d answer “I was never poor” (which he does… which is how I know he would… because he did… I’m so good). Louis was loved, and embraced by so many different people, he’s always felt like the richest man alive. At the end, when he invites the people important to him, he basically invites everyone he knows because they all matter to him, and he matters to all of them. Although, of course, none matters as much as Bok Sil, his “angel without wings.” That’s how he calls her, and in any other fiction it would be so cheesy it would make me cringe, because it would seem fake, and it’s an overused cliché, but here… okay, it’s still cheesy (and I love it), the whole show is made of cheese, Fievel and his family could feed on it for generations and generations, but the difference is first of all that… yeah, Bok Sil really is an angel. Maybe not literally, but I don’t care, she is. And also Louis is not trying to pay a nicely-put compliment, it’s not a figure of style to him, he’s being candid and honest: that’s actually (and rightfully) how he sees her. And “candid and honest” does nicely sums up Louis. “Loving” too. There’s a reason people are drawn to him, despite how childish he can get: he loves people first and gets to know them second. Louis meets people with the assumption that they’re good, always, and that’s his secret to being happy: be yourself, be kind, love people without prejudice, restraint or cynicism. That’s also the drama’s stance by the way, and the reason why I was never really scared of what direction it would take. Even in the best of dramas, there’s often this underlying fear that at some point, it will all go down the drain (because let’s face it, it almost always at least gets close to it, the drain gets a lot of guests), that the drama will suddenly fail because of trying to please the audience, force stupid unearned angst into its story, or because of time constraints, for example. I was never really scared with Shopping King Louis. Not of it going downhill (or at least not in a way that would make me like it less), and certainly not of forced drama and angst. There ARE sad moments in the show, but they don’t last. They hit, because I cared, but they don’t last. Because the show is very dedicated to making you happy. Because it loves you (yes, you! ), the people watching. And it also loves, loves, LOVES it characters so I knew it wouldn’t betray them. It wouldn’t just “sacrifice” them for a plot point or a cliffhanger, it loved them too much for that. The show has a very large cast of characters, loves them all, and so do I. I love Jo In Sung the leads’ neighbor despite how he started, I love his relationship with Louis, I love Jo In Sung’s mom, and how she becomes a mother to Bok Sil who really needs one, I love the male second lead, how he pushes Bok Sil to really fulfill her potential, I love also how he can’t help but like Louis, how he’ll sing him a song so he’s not scared of the dark, and how Louis in return confesses his love for him several times. I love Louis’ grandma, and I even like the female 2nd lead AND her mom. I love Louis’ butler, and his own love story. I love the nice cop trying to find Bok Sil’s brother. I loved everyone (maybe not the villain, but he doesn’t turn out to be much of one, he’s more of an idiot), and more importantly, everyone seemed to like each other (which helped). We’re talking about a show where all the mothers liked all of their potential daughters in law and sons in law: how often does that happen? NEVER. It never happens. And they also liked each other! They form a club, with nicknames, completely ignoring social status, and it doesn’t result in any competition. This drama is a love letter to togetherness. Is it realistic? Not really, no, I guess. Did it matter to me? Lol, nope, not even a little. I was just enjoying the lovefest. And thus, it didn’t matter if the story was quite absurd. First of all: the drama knows it. It’s basically telling you not to take it too seriously, via visual humor, via its poking fun at drama tropes, via its parodies (Secret Garden, Old Boy, etc), via its cheapness at times (I love that when they use the A whole new world song from Aladdin they clearly ripped a copy of the movie, as you can hear the sound effects FROM the movie), via its musical humor, as the drama uses a lot of different songs to make you laugh (Crooked, The winner takes it all, the In the mood for love theme music,…). Although some (but less of them) might also make you cry (My Way T.T), warm your heart, or all three of these things at the same time (Reality, She, Love is all you need). The story is simple, quite silly at times (often on purpose, sometimes not), but it doesn’t really matter: that’s part of the fun, and you’re enjoying the fun with the most adorable characters ever, so what’s not to like ? Also, true, the drama could have ended 4 episodes earlier than it did. There’s quite a nice ending at the end of episode 12, a happy ending, with “Dreaaaaams are my reality” playing (it made me tear up, yes… then again, gardening shows make me cry when snails can’t get to the salad leaf they want so I’m not a super-reliable test-subject), and the drama could have stopped there. It also could have stopped in episode 15, there was also a very nice ending there. And usually, that would be an issue, I’d have thought the drama overstayed its welcome, it would have started to drag… And some people certainly felt that way, but to me, it was just bonus time. I got to enjoy MORE time with all these wonderful people. Are you kidding? MOAR please. I’d have watched 4 more episodes gladly. Plus, although episodes 12 and 15 provided good endings (I mean, they’d have had to be a little tweaked maybe, but not that much) episode 16 concluded the show on the best words possible, and I’ll come back to that. As previously stated, I loved everyone in this, but the OTP, our lead couple, was still the biggest draw for me. Bok Sil, our heroin, is clever, full of potential, energetic, motivated, learns fast, has a backbone, a personality, some pride, and also infinite love and patience. Which, let’s face it, she needs. Louis is adorable, but also childish and he has “rich reflexes”. He’s spent his whole previous life spending large amounts of money and knowing nothing of the real world. Now he knows even less (amnesia and all) and only has “instincts”. His heart is in the right place, and though he does spend all Bok Sil’s savings, he spends it partly to buy her stuff to make her life easier because he wants to help. Still, he has a LOT to learn, and yeah, to deal with him (not that Bok Sil has to, but she does, because that’s who she is, and also because he is likeable in spite of it all), especially at first, patience is needed. That said, I never thought he came across as really bad (unlike, for example, the lead in Attic Cat who also does the “spend the savings” thing but in a totally different way, because he’s an a-hole), just really ignorant and pampered. Which kinda makes sense. Bok Sil and Louis have things in common: mostly loneliness and the feeling of being lost. Both of them have dead parents and were raised by their grandmother (well Bok Sil was… Louis was raised by his butler really, his grandmother monitoring from a distance, to “protect him”) and both of them grew up in very secluded places: Bok Sil in a mountain, and Louis was basically a prisoner, kept away from the world by his grandmother. One grew up poor, the other rich, so they don’t have the same reflexes at all, but they’re both new to the big city, and how it works, so they’re both a little lost. I really liked the way their relationship evolves. It feels very natural, and very “tacit”. They do express their feelings at some point, they make it clear, but though that comes eventually, their relationship evolves without them putting words on everything at first. They just gradually get closer and closer, naturally. It was very cute to watch, and warmed my heart to see how they could count on each other in different ways. Bok Sil’s a true guardian angel, keeping him under her roof (when she has one), and supporting him, and he is her emotional support. He’ll go wait for her with an umbrella at the bus stop, he’ll tell her how awesome she is, he’ll hug her when she’s hurt, and try to help with her work. They both support each other in different ways, giving the other what he/she needs. They’re so good together, really, that even the 2nd lead, in love with Bok Sil, ships them. He doesn’t want to admit it, but he totally does (and I love how grumpy he gets about it). And they’re so good, I didn’t even fear the future. What is the thing you dread most in an amnesia story? Me, it’s the “getting the memory back” part. Because it’s like amnesia again, so it’s frustrating too, albeit not exactly for the same reasons. When amnesia comes up in a story, it’s usually a few episodes affair, and it’s annoying because most of the time, you can see how it’s just a ploy for the screenwriter to make the story longer (I mean, yes, in some cases, it can work for a drama, but those are rare exceptions and the only one I really can come up with right now is I hear your voice). When memory comes back in an amnesia story, it’s different because it’s usually final. It’s not something that’ll last a few episodes before everything just gets back to normal: it’s the new-back-to-old normal. And when you invest in a character, watch him slowly build up relationships, watch him evolve, it can be very infuriating to see the table suddenly get wiped clean. Some dramas (probably?) do it right, but not a lot of them. So when I’m in an amnesia story, I always dread the “memory’s back!” moment, because I’ll lose the character I grew to love, because it’ll put a strain on the relationships he made with others, because it’ll make his newly-loved ones suffer, and we’ll go into agonizing angst. Amazingly, though, from the very start, I never feared the “memory’s back!” in Shopping King Louis. I had absolute faith in the drama’s will to be a pain-free experience, in Louis and in the strength of his relationship with Bok Sil. See, the thing is, Louis didn’t do an 180° when he lost his memory. He was nice before that, judging by how he was with the employees in his household, and he even already loved Bok Sil, falling for her at first sight over the tv. He saw her, loved her immediately, and when the tv said she was poor and struggling, his first thought was to send her a lot of stuff she would have had no use for (she said she dreamt of having a fridge, so he wanted to send her his, aw), because back then he already was everything he became post-amnesia: kind, generous, loving and really oblivious to how the world actually works. Once his memory would be back, he wouldn’t become a cold arrogant chaebol, because he never was that, he’d just be the Louis I knew, with more money. So yep, it was kind of amazing to me, but I was never afraid. I never doubted the drama. I think because Louis and Bok Sil open their hearts to people, people open theirs and the drama was the same to me: it wore its heart on its sleeve, and so I gave it mine. Without restraint, without cynicism, and I was rewarded for it. So, what makes you thankful? Me, a lot of things. And among these things, I’m thankful for fictions, even imperfect ones, that make me believe in happy endings, and commit, until the end, to putting a smile on my face. I did say the drama ended on the perfect words, right ? And that’s because it ends on the words “I love you”, while the soundtrack, in the background, plays the word “thank you”. Those are great words to end a drama with, and great words to say goodbye to those adorable characters with. They sum up what the drama’s “spirit” was to me, and they also nicely sum up what I felt for Shopping King Louis: I’m very thankful for all the joy, and I love you, drama. 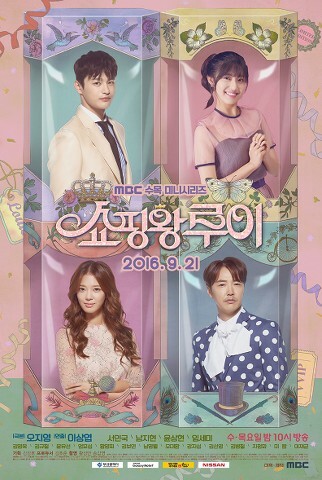 Oh, c’est la première critique que je lis sur Shopping King Louis ! J’ai trouvé que relativement peu de gens en ont parlé, alors que moi, j’ai tout simplement adoré. Comme tu l’as dit, le drama n’est pas parfait. Pour ma part, le couple principal était tellement chou qu’un seul épisode suffisait à me redonner le smile. Et je suis fan des happy endings en général, donc ce drama m’a vraiment plu. C’est d’ailleurs ici que j’ai découvert Nam Ji Hyun, que j’aime beaucoup. Merci d’être passée sur le calendrier de l’avent ♥ C’est gentil de nous avoir lues, Fleya et moi ! Merci d’être passée Sayuuna ! Voilà, ce drama était chaque semaine une bouffée d’air frais. Cela nous fait déjà un drama adoré en commun hihi.